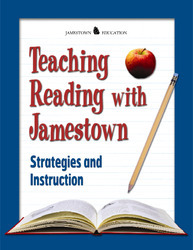 Teaching Reading with Jamestown provides all the support needed for the teaching of reading! Includes mini-lessons that can be applied to any reading materials, additional strategies for use with your Jamestown books, graphic organizers, and a placement test to help you start students off at an appropriate reading level. The placement test was developed by Edward B. Fry, Ph.D., Professor Emeritus, Rutgers University and author of Jamestown's Reading Improvement series and the Fry Readability Scale.